The rainbow has experienced a rise to fame in the last few years. Just about every area of culture has referenced this colorful symbol. A few years ago, 44 million viewers watched a video of a burly bearded man weeping like a baby after he witnessed and spoke (with awestruck wonder) about a double rainbow in the wilderness. His video went viral, he became know as the “Double Rainbow” guy, and we all just wanted to have a little bit of whatever he drank/ate right before that experience. In 2016, a bagel shop in Brooklyn made national headlines when it gave the world their first taste of the Rainbow bagel. I initially thought it was just plain bagel with food coloring, but apparently this curvy beauty is actually packing some deliciousness to it! Of course, there was the 2016 hit product of the year - “Squatty Potty”. Its highly viewed online commercial featured a unicorn defecating rainbow-flavored ice cream. Yum! The commercial was both ridiculous and awesome, and I would add, effective. (I didn’t exactly go shopping for a squatty potty afterward, but I did Google, “optimal pooping position” right after watching it). On a more serious note, there’s a segment of society, the LGBT community who would point to the colors of the rainbow as the symbol of their “gay pride” and the diversity of their communities. If you dig a little more, you’ll find that (for them), the colors represent respectively: sexuality, life, healing, sun, nature, art, harmony, and spirit. What was interesting to me in reading about these cultural references to the rainbow, and what had clearly become lost in all the rebranding was the actual true meaning and purpose of the rainbow itself. On my way in to work this morning, I actually pulled into a Quickchek to get some coffee and engaged some people with the question, “What do you think the rainbow means/represents?” One guy sorta blew me off with a, “I-have-no-idea, dude” shrug, but I suspect he thought I was trying to sell him something rainbow-flavored. Another lady and an older gentleman who chimed in attributed the rainbow to Ireland, then to Lucky Charms cereal. What no one pointed out me to, however, was the actual origin story of the rainbow found in the Bible in Genesis 9, right after the worldwide event of the flood [whether that was the actual first time the world saw a rainbow, or if God simply leveraged what was already in the sky to make a promise, is a discussion I will save for another blog post]. Let me bring you up to speed. In Genesis 6, God observes that mankind had become so sinfully corrupt that He actually regrets making humans on earth. This is bad. So bad that God decides He’s going to have a do-over by wiping out humans off the earth with a flood and start afresh with a man named Noah and his family. Noah is instructed to build a large sea vessel called an “ark” and to gather two of each kind of animal on it to preserve their species on it. In Genesis 7, the heavy rain starts and it’s a watery mess as heavy rains pour down and large bodies of water begin flooding, consuming all life on earth (except for Noah and his family safely on the ark). Have you ever wondered what kind of post-flood world Noah and his family stepped into when they walked out of that ark? If you grew up in Church, you might remember seeing those Bible story books where Noah and his family stepped out into a bright sunny day, sort of like what we would see after a rainy day when the sun comes out? That was cute, but as an adult who’s actually seen storms, you know now that those images could not have been accurate. Have you ever seen images of the aftermath of a category 5 hurricane and the floods that come with it? Dr. John D. Morris, a Ph.D from the Institute for Creation Research paints a vivid picture of what was taking place during the flood. He makes the case that “the fountains of the great deep” bursting forth would have included the eruption of underwater volcanoes, which shook the planet without stop, sending pulsating Tsunamis in every direction. He describes “the windows and floodgates of heaven” opening as not just a category 5 hurricane, but a type of storm called a “hypercane” which is dozens of times stronger than a category 5. In other words, the earth kinda broke! 40 days and 40 nights of a hypercane will leave in its wake cataclysmic damage. It’s into this violently shaken-up world, that Genesis 8:18 says Noah, “together with his sons and his wife and his sons’ wives [and all the animals and creature on the ark with him] stepped out into. The sky would have been a mess. The earth was a mess. Even the air would have been a little different than what Noah was accustomed to. This was scary new territory, not to mention the fact that the flood would have transported Noah’s family faraway from the area they had known as home. So this poor dude wouldn’t even have known where he was! So, that’s what it means to Noah. But what about the artist Himself? Interestingly, notice how God refers to the rainbow in Genesis 9:13; He calls it, “MY rainbow” – which is very telling because it means that He holds this promise super-close to His heart. In fact, the only other occasions where we see rainbows in the Bible is when it surrounds His personal throne in heaven. The prophet Ezekiel (1:28) in the Old Testament and the apostle John in the New Testament (Revelation 4:3) describe seeing the same thing when they received visions of God’s throne room in heaven, “Like the appearance of a rainbow in the clouds on a rainy day, so was the radiance around him.” (NIV). It may be hard to fathom, but this goes to shows that God hates sin and unrepentant sin grieves Him to the point of judgment. So then, when you read in Genesis 9:16 that God says anytime He sees the rainbow, He will remember His promise to humanity, that should make us breathe a little easier because it means that as long as the rainbow shows up after every storm, we’re still good! It means God will still mercifully continue to hold back His sweeping hand of judgment over humanity. So, here’s the part of my blog post that will not be fun to read. If a pure and holy God placed the rainbow in the sky as a constant reminder to Himself to restrain His righteous anger at sin, then that means He is actually still angry at sin. Remember, His anger didn’t just fizzle away, it was simply held off till a later time. If that seems unfair to you, then you have to consider the fact that because of the utter holiness of His nature, God cannot just let sin go or turn a blind eye to it. His holiness and justice demands that sin must be addressed and punished - otherwise He would not be a just God. What is even more disheartening is that humans haven’t changed much since the days of Noah. Humans are still sinful and are constantly coming up with new forms of evil. Romans 1:30 says we actually “invent new ways of doing evil” and have even gone as far as to redefine things God calls evil as good, and things God calls good as evil (Just like the people who lived in the day of Noah before they faced judgment). Here is why that should be of grave concern to the world. Though the rainbow STILL serves as a reminder to God to hold off on His sweeping judgment over humanity, the Bible tells us that there is a day coming when His anger will be held back no more. Revelation 6:14 tells is that there is a day coming when the sky and its rainbow will be rolled up like a scroll, and Jesus Christ, whom the world has mocked and belittled, will return to carry out His judgment. On that day, the sky that holds the rainbow will be gone and there will be no need for God to withhold His judgment because there'll no longer be any symbol in the sky. On that day, time will have run out for all those who still reject the offer of salvation that is extended through faith in Jesus Christ. BUT THAT DAY IS NOT HERE YET! This means there is still time to draw near to God the Father through faith in Jesus Christ. There is still time for YOU to confess with your mouth that Jesus Christ is Lord and believe in your heart that God raised Him from the dead so that you may be saved. The rainbow is an encouraging invitation for you and I to join in the mission of God. Whereas God instructed Noah in his day to build an ark to escape the coming judgment, God has similarly done FOR US, IN CHRIST what He did for Noah. 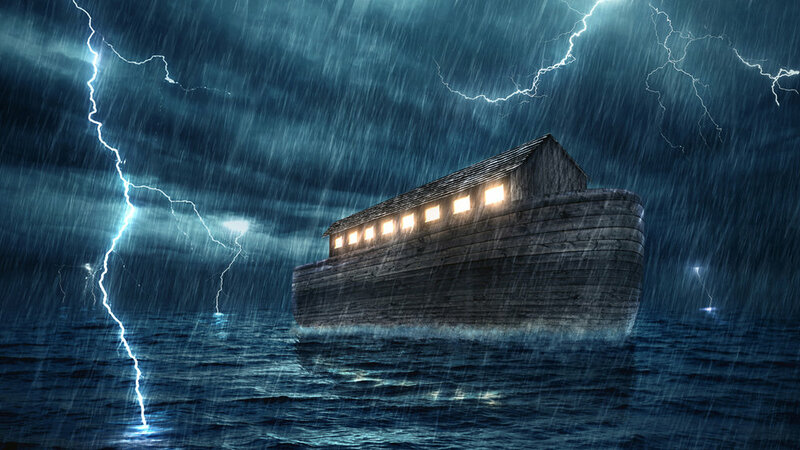 There is a worldwide judgment coming that will flood the earth and Jesus Christ is our ark of salvation! In the same way that the ark provided safety and security for Noah while judgment took place outside, so in the same way you will find safety and refuge in Jesus Christ alone, who died on the cross for our sin and paid back to God a penalty you and I could never afford! If you have already trusted in Jesus – Great! God will keep you secure eternally through your faith in Jesus Christ. However, you probably have people in your life, in your neighborhood, at work, and many others around the world who have never heard of the great patience and sacrificial love of God’s Son. They may never have heard what the rainbow truly represents. Christians have a great story to tell AND THERE’S STILL TIME because the rainbow still hangs in the sky after every storm. Let’s make it our life’s mission to make this message of hope in Jesus Christ known!